Water is life. From the demonstrations at Standing Rock reservation in North and South Dakota to the people of Flint, Michigan, when tap water is jeopardized, bottled water becomes a necessary resource. However, 76 percent (66/87) of TKC staff thinks for something that impacts life so much, bottled water is unjustifiably expensive. Here in Kirkwood, we are lucky to have high quality tap water that is safe for drinking, cooking and cleaning; according to the City of Kirkwood’s Annual Quality Report for 2016, there were no violations of the Department of Natural Resources’ regulations on water contaminants. If a student at KHS forgets their reusable water bottle at home, they have the option of going to one of the 31 drinking fountains around the school. But not everyone in the United States has the luxury of trusting what comes out of their faucet. That’s where bottled water comes into play. Hurricane Harvey struck Texas Aug. 25, 2017, causing around 30,000 people to evacuate from the Houston area. According to The Washington Post, one local business took advantage of evacuees searching for essential items and sold cases of bottled water for as much as $99. Many other businesses, including a branch of Best Buy, also ramped up their prices. Luckily, price-gouging is illegal and usually ends with fines when done in times of crisis, but even normally priced water bottles cost too much. 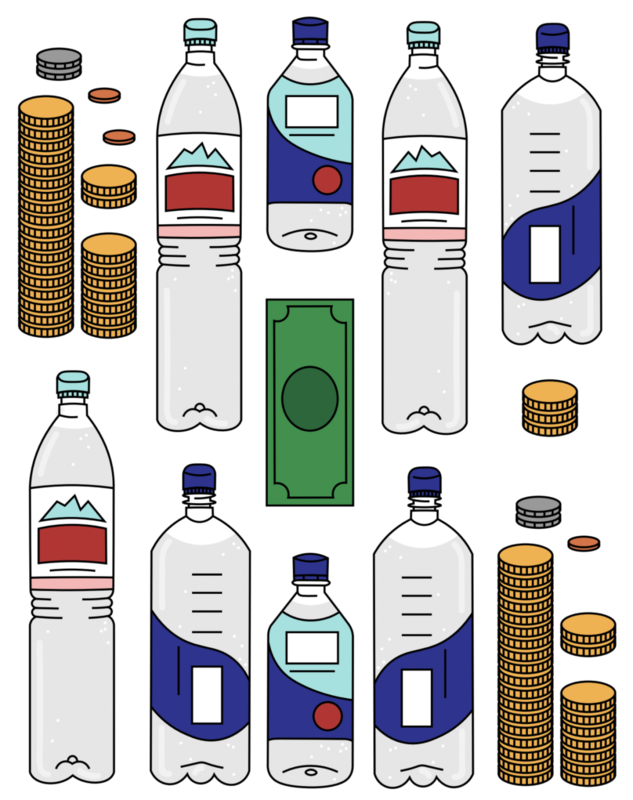 In research done by The Atlantic and Business Insider, bottled water at an average price range of $1.22 to $7.50 per gallon can be from 200 to 10,000 times more expensive than tap water. Though it’s easy to say you’ll pay a few dollars for a water bottle now and then, not everyone has that convenience. It isn’t right for such high prices to stand in the way of people who actually need clean water on a regular basis. Reusable water bottles are often offered up as an alternative to plastic water bottles, but if someone doesn’t have the money to spend on plastic bottles, they most likely won’t have it to spend on name-brand reusable bottles. Even with a reusable bottle, they would need access to clean tap water to fill it with. For residents of Flint, Mich., buying purified bottled water is the only option due to their city’s water being contaminated with lead, among other things, from the water pipes. It’s important to remember we’re lucky to have safe tap water for all our basic needs in Kirkwood; imagine having to buy enough water to drink, clean with, bathe in and cook with at such an inflated price compared to the normal monthly water bill. At that point, water loses its convenience and seems like a luxury rather than something you can’t live without. It’s simply not fair to raise prices when drinking water isn’t much of a choice. To make matters worse, people who store water bottles for future use from grocery and convenience stores aren’t always paying for safe water. Safe compared to pond water, maybe, but not compared to the typical standard of drinking water. A study from the National Center for Biotechnology Information (NCBI) invalidates their high price with major health concerns. The longer plastic water bottles are stored, especially at rising temperatures, increased amounts of antimony and bisphenol A (BPA) leach from the plastic into the water. These specific chemicals can lead to heart disease and even cause cancer. For those who stock up on cases of non BPA-free water bottles for future use, they aren’t exactly getting their money’s worth. Still want to pay more for your water to come prepackaged instead of out of the faucet? We don’t. But go ahead and forget the health risks. Even one-time use water bottles with no health risks are still all too expensive. There are reasons for the high prices, like the processing of the plastic. However, when the plastic ends up in a trash can, then in a landfill, our money is really going toward trash. And frankly, trash, health risks and inconvenience aren’t worth paying for.